Yesterday we took my son back up to Sudbury after his fall reading week! We drove him, his roommate and his best friend who was coming to visit for the weekend. I was not a blubbering mess this time. During this past week I was able to see how he has grown and matured over the past 7 weeks and with a hug, an I love you, a wee bit of a lump in my throat off he went with his friends and a promise to see me when he returns home for Christmas. 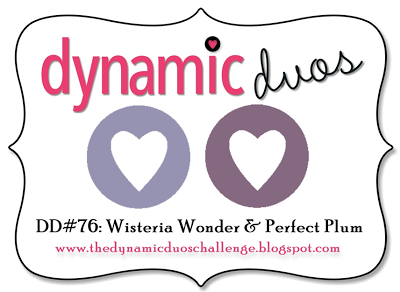 Time for a new colour duo at Dynamic Duos. I can't believe how fast the last 6 month's have gone. This is the last week for the current Design Team and I have had such a great time working with and getting to know such a talented group of ladies. Thank for Lesley and Anne Marie for the opportunity! 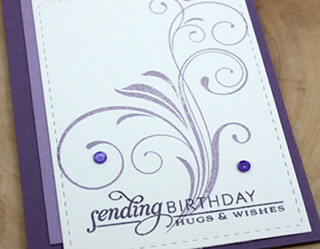 I used only the two shades of purple on my card finishing it off with a few purple sequins. Hope you come and play along with us this week. 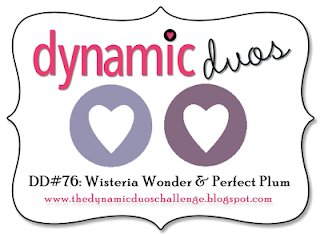 Pop over to Dynamic Duos and see what the rest of the team has created for your inspiration! yeh no tears! Must be wonderful seeing him grow up and mature-well done to Mum! Beautifully elegant! I do like the flourish and touch of sparkle with the sequins! This is gorgeous Tracey. I love how the flourish is the focal point. I'm glad you were able to see your son. Sounds like he is doing well. Beautiful! LOVING the colors and the sequins!!! This is so very pretty my friend, love the big flourish! It's never easy to take them back to school, but it does get easier to hold those tears back! Gosh how I remember those days. They do grow and change so quickly. I still can't believe my baby boy is a married "man"!!! Holy smokes!!! You sound just like one of my younger sisters, she always says that! “ Its all good”. Sounds like a nice visit. Gorgeous card Tracey and love the colors. Love the gradient of card stock colors! You have used the stamps so superbly, Tracey! Glad to hear that you (and son) are all transitioning well into the changes! That is one big milestone that you should be proud of!! Love, love, love this card, Tracey--nothing else to say! So glad your son has done well & you can let him go back a bit easier this time. Beautiful card and sentiment, Tracey. Life is about changes...right? Hug them when you have them! So glad you had such a great visit with your son! I'm sure it was beyond bliss to have everyone home. Your card is beautiful. I love Fancy Flourishes! I'll bet this week went fast for you. 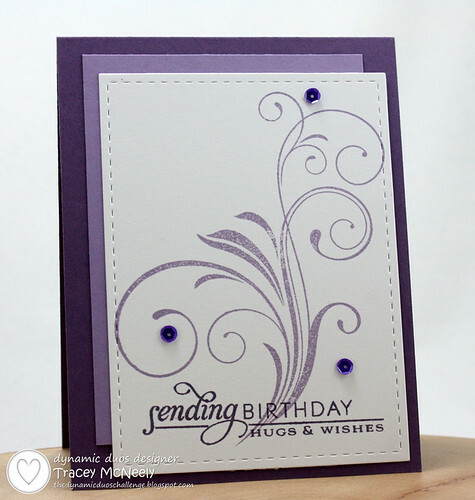 Love this all purple card ~ the flourish is beautiful! Thanks for choosing my card this week for a Dynamic Darling! Beautiful use of the challenge colors. Love your card and that pretty flourish. It's been an honour being on the Dynamic Duos team with you! Your card is just gorgeous Tracey! That swirl stamp is one of my very favorites! Glad you had a nice visit with your son. Mine are growing up way too fast. My son is wanting to drive now, and my girl is wearing my clothes and shoes! Beautiful card, Tracey! Love the Fancy Flourish with the sequins placed just right on your CAS design. Hello gorgeous! This card is so lovely! This is so elegant. I never think to use those flourishes as a focal point, but they are terrific. Yet another gorgeous CAS creation, Tracey!! I admire your talent for CAS :) It's been such an amazing 6 months working with you - we will for sure bump into each other in blogland :) Hugs!!! P.S. Thanks to you, I have been buying those Lil' Inker stitched dies. Love them!!! Tracey, you are the queen of sequins! What a nice finish to the swirl image. I hear Stampin' Up! is coming out with sequins soon, can't wait! Thanks for the fun times we've had on the DD team together!